This year, the Japan Sumo Association and matchmaking website Konpa de Koi Plan are giving eligible singles a chance to mingle and possibly fall in love at the ongoing March sumo tournament. The special event, called sumokon, is a portmanteau of sumo and konpa, which means “company.” It is derived from another abbreviated term — gōkon, which translates as a group blind date. A typical gōkon usually takes place at an izakaya (pub), consisting of even-numbered male and female members. Games are sometimes played to break the ice. This scenario is popular in Japan as it takes away the pressure of meeting a date one on one. More large-scale gōkon have emerged over the years and proven to be profitable for the organizers. One example is machikon, a mixer event that involves bar hopping. Recently, the increase in younger sumo wrestlers has attracted more female spectators — and, in turn, the matchmaking business. On March 18, a spectator booth at the Osaka BodyMaker Colosseum will be reserved for five men and women between the ages of 20 and 45. “We wanted to expand the field of dating,” explained Chie Goda, marketing manager at Goodwill Planning, which is helping promote Konpa de Koi Plan. According to Goda, Konpa de Koi have recently been focusing on supōtsu-kon, where members can view their favorite sport with their blind date. “Last year, we did a baseball-kon and horse racing-kon,” Goda said. 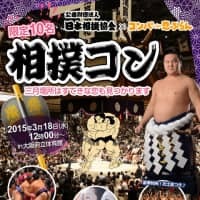 To some, watching large, half-naked men tackle each other may not be the ideal romantic setting, but this unique blend of traditional culture and modern dating may be the perfect combination for single sumo fans, or, perhaps, a good icebreaker. But the men may find themselves competing for the ladies’ attention as new young wrestlers like Bana Asayama, a former bodybuilder, make their debuts this season. The sumokon begin with lunch, followed by a photo session with a former rikishi (sumo wrestler). Members will then receive free sumo souvenirs before watching the tournament. The charge is ¥9,800 for men and ¥6,800 for women.